Hello. It's been a while but I'm back blogging. I am sharing my first sneak peak of Sheena's new stamps which will be on Create and Craft on Saturday at 10am and 3 pm. I am in love with these stamps, and the new clear rock a blocks. They make stamping so much easier now, and I don't think I will use anything else now. Anyway back to the stamps. 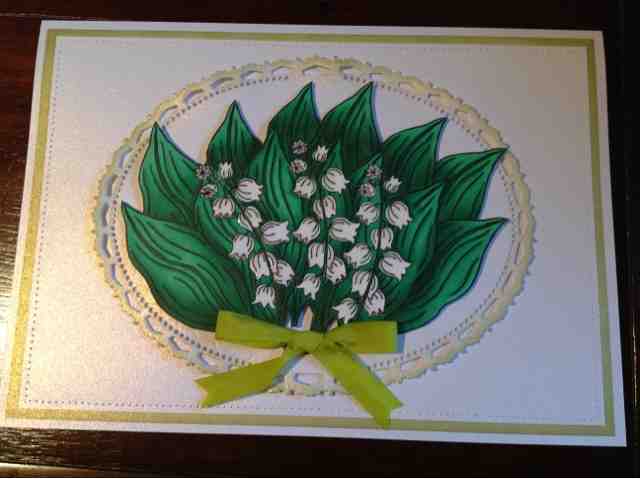 As you can see I have used the Lily of the Valley stamp plate. There was a lot of masking with this card, but I thoroughly enjoyed making it. The image is coloured with Copics, a grand spellbinder nestability had its edges distressed with peeled paint. I hie you like it, as with this one I wanted it to look quite clean and simple. Keep your eyes open for more sneak peaks. Stunning Caroline you have done a fab job.